On Saturday night I joked on Twitter that in Carlsbad we had a scenario that more or less equaled certain doom for Samantha Jane Stosur. Why? Well, first of all, she was in a WTA final. In her illustrious career, the Aussie had played in 15 finals before Sunday’s decider in California. Her record? 3 wins…and 12 defeats. Her last title was the 2011 US Open. We’re in 2013 now. The other ingredient was Stosur’s opponent in said final. Victoria Azarenka had won all 8 matches between the two, and two thirds of that joint history is simply gory. Heck, it took Stosur 7 years just to take a set from Azarenka. The two things Stosur has done well are the two things that don't show up on stats – serving and returning. The good news for him: Stosur’s performance does show up in the numbers within this post! 1) Stosur returned at an elite level, which is something I did not expect at all. Kevin Skinner kept mentioning during the broadcast that after the pair’s last meeting in Rome, Stosur had said that she was getting very good reads on Azarenka’s serve. We’ll see below just how dialed in Stosur was yesterday. 2) Azarenka was having a pretty atrocious serving day, particularly during a first set in which she achieved the dubious feat of hitting more double faults (5) than correctly placed second serves (4). Let’s also remember that Azarenka also hit 7 double faults against Ivanovic in the semifinals…but that was over three sets of tennis. – Herein lies the key to Stosur’s success in the Carlsbad final (or half the key, as we’ll see below): she returned a vast majority of Azarenka’s first serves. Notice how Stosur conceded a single free point over 5 service games. Yes, Azarenka cut back on the double faults in the second set and managed to squeak out a few free points on serve, but the damage was done by then. Sam Stosur’s return of serve in the opening set was nothing short of remarkable. Simply put, the former US Open champ put everything back in play, and most of it was deep. – This graph has the evidence (inside the big red highlight) for Azarenka’s dubious 1st set feat detailed after the first table above. It also has the funniest stat from this match, and one of the funniest I’ve seen in a while: the fact that Samantha Jane managed to return just one second serve deep (good for 11%). Usually when you talk about a dominant return of serve performance, the damage is mostly done in the second serve. Not yesterday, though: Stosur dominated with her first serve returns. Actually, Sam was having a hard time getting looks at those second serves, since Azarenka was more likely to double-fault than to hit a proper second serve for a significant portion of the match. – Notice the 8 double faults by Stosur. Not a great stat, but it shouldn’t take away from her great serving performance overall, as we’ll see below. – Remember how Azarenka was in the 70s for percentage of total serves returned against Ivanovic? She was well within mediocrity in the final. 64% of total serves returned won’t cut it in a big match – not even against somebody who has never beaten you in 8 years. – It’s important to note just how key the fifth game of the first set and the opening game of the second set were. As you can see, Azarenka had 5 break points in each of those games. None were converted. Also note that one of the best returners in the world couldn’t muster a single break chance after that initial game of the second set. – Here’s that other half of the key to Stosur’s success, and part of the point Tumaini was making: tennis doesn’t keep track of service winners, so when you look at the Carlsbad final numbers, you’ll see that Stosur ended with 2 more double faults than aces. Which sounds terrible, because you won’t see the 14 service winners Sam tallied throughout the match. Also important: Stosur got at least one free point in all but one of her service games. She would end up with 23 total free points (when adding 2nd serve free points), which more than offset those 8 double faults. – Yesterday Azarenka returned 64% of Ana Ivanovic’s 1st serves, and 61% of those returns were deep. Notice how different those numbers look from the table above. – It’s safe to say Victoria Azarenka was struggling to get those trademark Stosur kick serves back with any type of depth. This is where Victoria usually dominates opponents, and in the Carlsbad final she just wasn’t able to do it. At all. 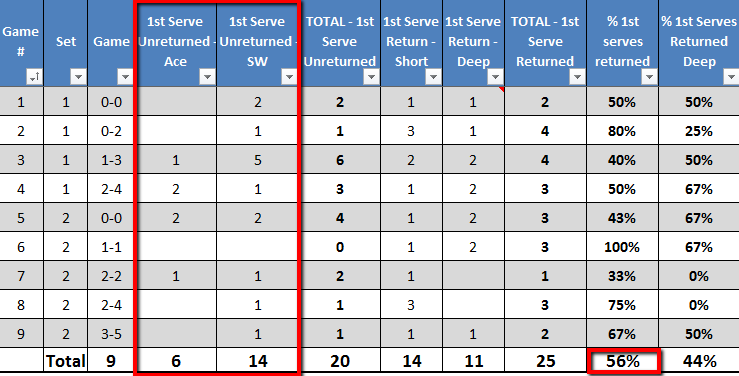 And you know what short returns mean: more chances for Serve + 1s (when a server can set up for an aggressive forehand after the serve). Against a dialed in Samantha Stosur, that’s just not a winning proposition. Is there anything I missed? Did you other interesting things in the data? Do let me know in the comments section below.